Pavolva with Lemon Curd and Fresh Berries is a simple and delicious dessert perfect for summer gatherings and celebrations. If you’ve been reading Never Enough Thyme for a while, you have to know that old fashioned, heirloom recipes are very near and dear to my heart. They connect us to our past in very literal ways. Every southerner knows that food and family go hand-in-hand and this cookbook is all about passing down cherished recipes. 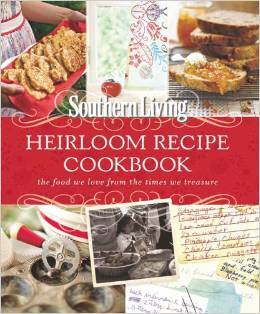 It includes more than 200 of Southern Living’s favorite and most memorable recipes from the last 40 years. Full of signature Southern recipes like Southern Cheddar Spoon Bread, Chesapeake Bay Crab Cakes, Dixie Fried Chicken, and Hummingbird Cake plus classic cocktails like Mint Juleps and Old-Fashioneds made with Sweet Citrus Syrup. There are also a handful of recipes made two ways: “Mama’s Way” or “Your Way,” traditional and then slightly lightened up and healthier versions of dishes like Pecan-Peach Cobbler and collard greens. I’m really enjoying its distinctive vintage look, with timeworn recipes cards, full-color photos, and short essays about Southern culture throughout the book. The day I received my copy, I sat down with a big glass of sweet iced tea and starting planning what I wanted to cook. It was pretty hard to choose just one to start with, but I went for this luscious Pavlova with Lemon Curd and Fresh Berries. If you’ve never made Pavlova, don’t fret. It’s just a big old meringue. And you don’t even have to make the lemon curd from scratch. Just grab a jar off the grocery store shelf. It’s good stuff. 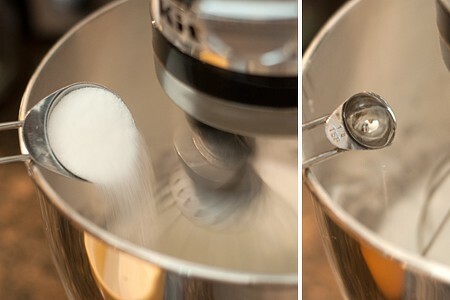 In a small bowl, combine the sugar and cornstarch whisking until well mixed. In a large mixing bowl, beat the egg whites for 1 minute at a medium-high speed. This task is made infinitely easier using a stand or hand-held mixer :-). Add the cream of tartar and salt and beat until blended. Begin adding the sugar-cornstarch mixture, one tablespoon at a time, until the mixture is glossy and has formed stiff peaks. Be careful not to overbeat, but make sure all the sugar is dissolved. Beat in the vanilla. I like to use clear vanilla to keep the meringue as purely white as possible. Line a baking sheet with parchment paper and gently spread the meringue mixture into a 7-inch circle. 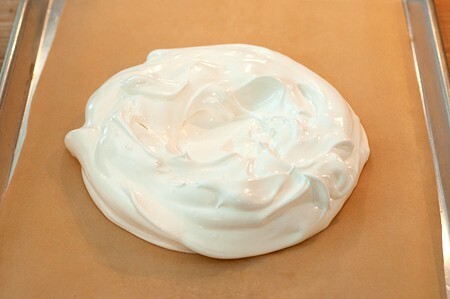 Make a slight indentation in the center of the meringue where you will later place the filling. When ready to serve, whisk together the lemon curd and sour cream. Spoon into the center of the cooled meringue. Top with berries and grated lemon zest. Light, crispy meringue topped with tangy lemon curd and fresh berries. 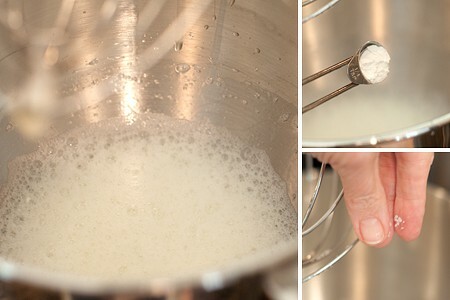 In a large mixing bowl, beat the egg whites for 1 minute at a medium-high speed. A stand or hand-held mixer may be used. Add the cream of tartar and salt and beat until blended. Begin adding the sugar-cornstarch mixture, one tablespoon at a time, until the mixture is glossy and has formed stiff peaks. Be careful not to overbeat, but all sugar should be dissolved. Beat in the vanilla. Bake for 1 hour, 30 minutes or until barely pale golden and the outside has formed a crust. Turn the oven off and let the meringue stand in the oven with the light on for 12 hours. 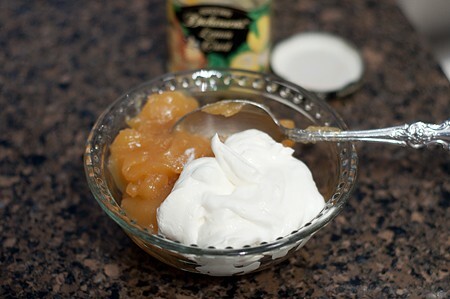 When ready to serve, whisk together the lemon curd and sour cream. Spoon into the center of the cooled meringue. Top with berries and lemon zest. 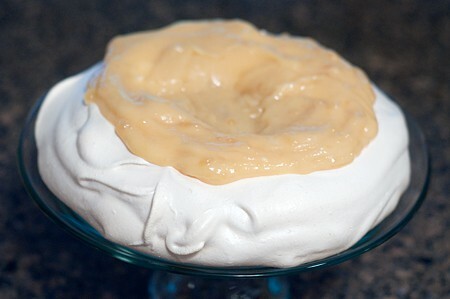 (Note: the center of the meringue may fall or crush when the curd is applied. That’s perfectly normal. Note: additional standing time of 12 hours is required. Recipe source: Southern Living "Heirloom Recipe Cookbook"
Oh…. my. I am speechless. That looks WONDERFUL!!! What an impressive dessert for my next gathering. Most memorable heritage recipe from our family? Hands down, without a doubt, Mama’s Dressing. It was/is served every Thanksgiving and every Christmas. All of the best memories are attached to our family gatherings, with this dish as a main component. As one of our great aunts used to say, we are Southerners – when we gather, we talk and we eat and don’t know which we do better. Mama’s Dressing is the best tasting stuff this side of heaven. We all make sure to take home the leftovers, and kind of fight over the crispy corners. It is and shall always be an immediate taste memory of happy times and loving hearts. My favorite heirloom recipe is for Gingerbread, passed down to me by my aunt, my daddy’s sister, about 35 years ago and she said it was over 100 years old then. That means it may be about 150 years old now! I have never had it fail, and I usually have to discipline myself not to eat the whole thing. I save it for Thanksgiving and Christmas, and neither holiday is complete without it, according to my 8 children! It truly is a classic. My grandmother made the best cookies. They were crisp, never chewy or soft. My roommates in college looked forward to her care packages. I love pavlovas and think they are actually timeless; they hit all the right notes with me! I can’t wait to try this recipe! 12 hours is going to be tough, but I’ll do it. Childhood memories… my mother didn’t cook so I did. But I had a wonderful neighbor that taught me a lot about the art of cooking. An older southern woman, she made the best fried fish and lightest Hush Puppies I have ever eaten. I never did master the hush puppies, she just had a touch. I would LOVE to win the cookbook! Please count me in. My family recipe is one that we make at Christmas, it is a wonderful pound cake with candied cherries in every bite. I always remember Christmas’s past when making, my mouth is watering just writing this. My favorite heritage recipe is my grandmother’s blackberry cobbler. My favorite heirloom recipe would have to be my Grandma’s peach pie (and pie crust cookies). I’d get to help my Grandpa pick the peaches, and always sample one or two. It seemed like forever waiting for dinner, and the finished pie to cool! Grandma always spread butter on the leftover pie crust, cut it into pieces, and sprinkled it with cinnamon and sugar. She baked them for us kids and called them “pie crust cookies”. Today my grandkids get to help pick the peaches and we always make pie crust cookies. Hopefully, one day they’ll make them with their kids, too! This is just beautiful Lana! I’m going to have to check out that cookbook, looks amazing! I love my mother’s sponge cake with mocha frosting. My grandma made the best potato salad in the world. She didn’t use recipes, carried them in her head. I would love to have this wonderful cookbook! I too love your recipes, have tried some and will be trying many more. Thank you for your site, love it. Till I was reading this I have not thought of or remembered the HUMMINGBIRD CAKE! My grandma used to make this cake for special times. This cake will be baked this weekend! This looks fantastic. Every time that I have tried to make meringue shells they get tough and soggy. I think that is due to the humidity in our area. I am going to try this one and see if I can have some success with it. Nothing I like better than to read old cook-books. Hard to believe the amount of fat and sugar that was included in recipes even 10 years ago. Love to have this book. my granddad’s Irish stew. he took all day to make it and it was so good, wish I had a bowl of it now. It’s a toss up between my grandmother’s molasses cookies and her home-fried potatoes. I watched her make them and wrote down notes but mine just don’t take the same. Must be Grandma’s love that’s missing or the wood-fired stove. Now I’ve given you a clue to my age. Mom was a great cook, but she liked to make desserts of all kinds the most (and she still likes to eat them). I can’t narrow down just one in my memory although I still use family recipes. Strawberry shortcake. She made the cake from scratch . Love pavlova. That looks so good! Favorite heirloom dessert, hmmm. When I think of my grandma, I always think of angel food cake. For all our birthdays she make one with lots of frosting. Not sure how heirloom that is, but that’s the first thing that comes to mind. my favorite heirloom recipe is my Mamaw’s Lemon Cake, sweet and tart with a thin shell of icing but moist on the bottom. Mine aren’t as good as hers but come in a close second. This is so impressive! I love it! My mother always made homemade meringues, they were the best! There are so many recipes filled with memories, but one that is special is rice in the oven as we call it. Rice with spaghetti sauce, tiny meatballs, sliced hardboiled eggs, and mozzarella cheese. It makes tons and was always served when a crowd of relatives descended on Grandma’s house. We’re Italian in case you haven’t guessed. The Pavlova sounds delicious. My favorite heirloom recipe is my grandmother’s recipe for shoo-fly pie. It is delicious, but mine never tastes as good as hers did! I’m fairly certain that my favorite thing about summer is fresh berries! I once asked my dad for some family recipes. He told me his mother used to make beef with noodles and tomato soup. I made it my mission to cook delicious meals for my family since his sounded disgusting! This pavlova is definitely something I have to make! It looks amazing! My grandmother made the best fried chicken and always with chicken and rice and speckled butter beans on the side. My mom is famous for her potato salad! My Grandma was good at everything. She made several things I just love, her biscuits and her cloud cake with seven minute icing and a fudge drizzle. She also make homemade chicken a la king to die for. I wish I had all of her recipes but alas I only got her Christmas cookie recipes. She always made at least 12 kinds to have around the christmas punch in handmade glass bubble bowls on Christmas eve! Every Saturday night my grandmother would make her raisin bread from scratch. Now, keep in mind that I just cannot stand the taste of raisins, so every time she made it I couldn’t wait till it came out of the oven it smelled so good! When we finally got to eat a piece it would take me till the bread was just luke warm to take out all the raisins in my two slices of bread, but the taste was incredible and I didn’t mind taking the time to remove the raisins. She also made an incredible dark date nut bread that to this day is the best batter bread I have ever tasted. Can I tell you what I hate about heirloom recipes? Is when no one thinks to write it down before your grandmother dies. Or you think someone has it and they don’t. My grandmother made butter cut-out cookies that were divine. They were rolled out and cut with cookie cutters and they just melted in your mouth. They weren’t as sweet as sugar cookies, and I loved them. I thought my mom had her recipe but she doesn’t. Now I have no idea how to make those cookies and I’ve yet to find one that comes close. I’ve always wanted to make a pavlova but never have. Yours looks so lovely, Lana! 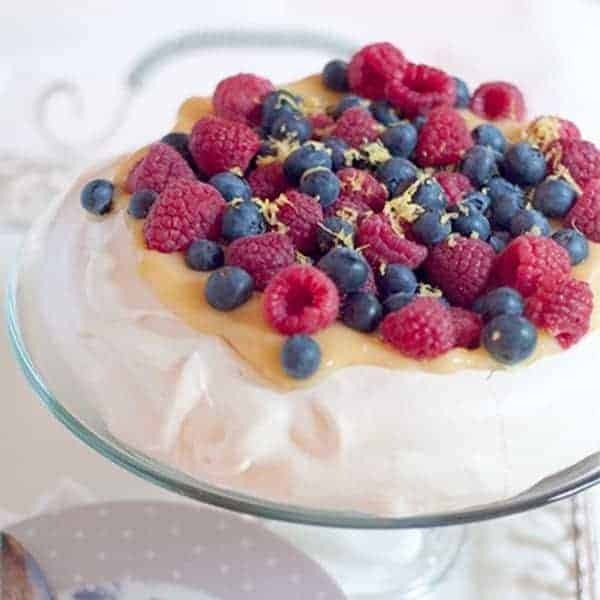 Love the lemon curd and berries you’ve topped yours with! My favorite recipe is from my Grandmother for Scottish shortbread. I can never quite perfect it and I certainly have tried!! She was born in Scotland and lived there until about 1928. My great aunt made bacon grease cookies that were to die for! And her oatmeal cake, and her orange slice cake. Wow, as a child I couldn’t wait to see what she had whipped up for us when we came to visit. I adore heirloom recipes and vintage cookbooks! This new Southern Living cookbook sounds like the best of both worlds. Gorgeous pavlova! I’ve never met a Southern Living cookbook I didn’t like! They just have a way of presenting everything that makes it look like any of us could actually do it, too. My Granny was a wonderful cook. There is no specific heirloom recipe because everything she did was so easy and so good. We grew up eating skillet-fried pork chops with gravy and homemade biscuits. We were poor and life was good. My Auntie used to make a truly delicious pearl tapioca pudding with either apples in the fall, or peaches in the summer. She made up the tapioca mixture and then added the fruit and baked it. I wish I had asked her how she made it. It’s just a wonderful memory now. My grandparents loved to give us popsicles and creamsicles, which were always my favorite. (My grandparents always had a box of creamsicles that were just for me.) Now, I make a creamsicle pie that always makes me think of my grandparents. I would love to have this wonderful cookbook from Southern Living! My mother’s contribution to the family reunion each August was Blackberry Congealed Salad made with Royal Brand Jello. It had a cream cheese/pecan topping. Folks would nearly knock mother down in the parking lot to make sure they got a big serving! Ever since I saw Nigella make a pavlova on Nigella Bites eons ago, I have wanted to do one. I LOVE how you combined the lemon and berries – sounds delicious! Not entering the giveaway, I’m a Canuck, but wanted to say how gorgeous this is. It’s absolutely stunning. I love pavlova with curb and berries. It’s such an elegant dessert. Oh, that looks sooo good! I have made this before and I am familiar with how wonderful it tastes. :) Nice job. My favorite old-time recipe would be Dad’s light and fluffy biscuits. This looks absolutely fabulous!!! I have a large italian family where love= food. So I grew up with delicious italian sauces especially the Sunday Gravy that would simmer all day and only grow in flavor! I love my grandmothers egg custard pie! Favorite family recipes are Moms cornbread dressing and my grandmothers blackberry cobbler…heaven! Oh and macaroni and cheese. My fathers secret pasta salad! From my mama – Cream Cheese Pound Cake. From my mama’s mama – Raisin Pecan Pie. I have been making both of these recipes for about 40 years. They always bring back “precious memories”. Lana, who won the cookbook? Thanks for asking, Dinah. I did the drawing, notified the winner *twice* and never got a response. I drew again this morning and have notified that person. If she doesn’t respond by tomorrow morning, I guess I’ll draw a third time. Never had this problem with a giveaway before! what a great recipe! just what i was looking for, thanks for the inspiration.